37 residents of Middletown, New Jersey, were killed: "Seeing that hole, it affects you." (CNN) -- The entrance to Point Roberts, Washington, looks like something out of the old Soviet bloc. Armed officers staff a beige outpost. Drivers and passengers face questioning. Vehicles automatically get scanned for radiation, to make sure there are no dirty bombs. "What do you mean you're here to do interviews?" the officer sneers. Dressed in body armor, she looks amped up and primed to Tase. Welcome to the safest place in America, where the Department of Homeland Security has spent millions beefing up the border crossing at a place 3,000 miles from ground zero and so remote it's not even connected to the mainland: To get here, you drive through Canada. A government-controlled gated community, residents call it. A place where the reverberations of 9/11 are felt several times a day. Many of the 1,300 people living in this distant place were still asleep 10 years ago when the attacks began in New York. It was just 5:46 a.m. here when American Airlines Flight 11 slammed into the North Tower of the World Trade Center. After the second plane struck at 6:03 a.m., ringing phones awakened residents as friends and loved ones called to say, "Turn on the TV." Two more hijacked planes flew over the nation's skies: American Airlines Flight 77 hit the Pentagon; United Airlines Flight 93 crashed in a field in Shanksville, Pennsylvania, after passengers revolted, sacrificing themselves to save others. It didn't matter where you lived in America, or whether you knew one of the 2,977 lives stolen, the attacks were personal. The country united. A nation made painfully aware of its vulnerability would go to war in Afghanistan and fortify the home front. It was the day that changed America. 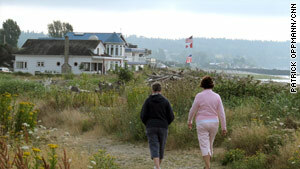 Border town Point Roberts, Washington, has become even more isolated since the attacks of 9/11. As the 10th anniversary of the attacks arrive, it's only natural to assess the impact of that day, to note all that has transpired because of it. But for those whose loved ones perished, the enduring loss is immeasurable. They do not ask whether 9/11 still ripples through their lives. They feel its presence with every breath. The same can be said for those who've seen friends and relatives march off to war, or who've made that journey themselves. The stories of men and women who responded to 9/11 by enlisting in the military are legion. Some came home, changed. Some never made it back. In New York, even as the void left by the iconic twin towers is filled with four massive new buildings, a museum and a memorial, the trigger points of 9/11 are omnipresent. A low-flying plane strikes fear. The stench of burning fuel invokes flashbacks. Wailing sirens stir heartbeats. "The closer you are to the tragedy, the more you live it on a daily basis. You feel the impact of it much more so than if you live in Iowa or Nebraska," Tom Richardelli told me, just before catching the train to the city from his home in Middletown, New Jersey. "Seeing it every day, seeing that hole, it affects you." But beyond the obvious -- like increased airport security -- what are the lingering effects of 9/11 for the rest of the country, for the 300 million Americans who live outside New York, Washington and Shanksville? I decided to visit three disparate locations, to sample the reverberations from coast to coast. 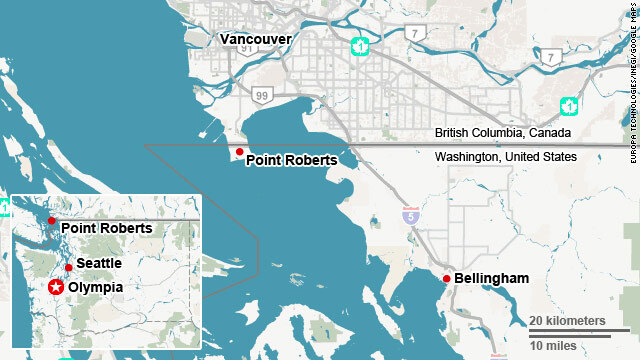 I chose Point Roberts in the Pacific Northwest because of its distance from ground zero and its fortified border. In Middle America, I'd visit a community that had no personal connection to the attacks but had applied for rubble from the towers to build a town memorial. And finally, I journeyed to a place where I knew the effects of 9/11 would remain strong: one of the New Jersey towns where so many who commuted to New York failed to make the return trip home. Point Roberts is an American anomaly. The only way to reach it by car is to exit America. You leave the mainland at Blaine, Washington, drive about 45 minutes inside Canada and hook around until you reach the massive checkpoint. When the 49th parallel was designated as the border here between the United States and Canada on June 15, 1846, it created a geographical glitch. Point Roberts sits at the tip of the Tsawwassen Peninsula in British Columbia that dips below the 49th parallel. The Point or Point Bob, as it's known, is surrounded by water on three sides and Canada to the north. The 4.9-square-mile strip is cut off from the rest of America. Since 9/11, it has become even more isolated. Take a spin down Roosevelt Road, an isolated street that runs along the 49th parallel. 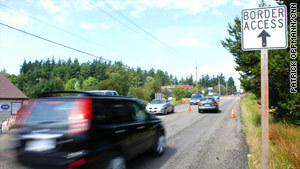 Despite the extensive vehicle checkpoint, the border along Roosevelt Road is invisible. You can walk across. The backyards of homes in Canada nestle up against the road in America. Canadian Doug Adams has a trampoline conspicuously placed in his backyard. It appears to sit in both Canada and the United States. "It's an international trampoline," he says with a chuckle. "Yeah, it's the peace trampoline." I talk to him from the United States. He shouts from Canada. He's got four children, ranging in age from 13 to 20. If they're playing ball and it leaves the yard, I ask, do the kids break international law and fetch it? He scratches his head, hems and haws. "No comment. I don't want the CIA and FBI and Border guards coming to knock on my door. "Since 9/11," he says, "you have to respect the 49th parallel a lot more. The U.S. is at war with an invisible enemy. And with terrorists and all that, you can understand it." Before 9/11, he liked to walk from his home into the United States and down to the Point Roberts beach. It was illegal, but there was a nod-and-wink understanding. "No way," he says, "not now." U.S. Customs and Border Protection (an agency that didn't exist 10 years ago) has bolstered staffing and surveillance -- by foot, air and sea -- and added high-tech equipment like radiation sensors and a live video feed to the mainland. Even if all roads lead nowhere, Point Roberts' international border makes it a security priority. "Our mission is the same in Point Roberts as the rest of the nation's points of entry: Border security is job No. 1," says Mike Milne, spokesman for U.S. Customs and Border Protection. A person wanting to cause harm, he says, could take a ferry from the Point to the mainland or hop a plane from the grassy airstrip. At the Point Roberts Coffee Roasting Company, you find a different point of view. "You wanna tell those guys at the border: It's none of your business," says Fred Zeilinger. "But you don't play around with these guys." Adds Jim Peltier, whose family has lived in Point Roberts since 1855: "Being in jail has its advantages and disadvantages." The two lap up coffee at the shop inside the Shell station. The first thing you notice on the Point is the gas prices: $1.09. Don't get too excited. That's per liter. The second: The place is a time warp. There are no chain stores. No Starbucks, no McDonald's, no strip malls, no big hotels, no cell phone towers. It's America before the corporate takeover. A beach community with no development. The houses are mostly humble Icelandic homesteads shaded by lush red cedars that stretch 80 feet into the sky. It's the type of place where you can ask a stranger: "Can I bunk at your place?" Odds are you'll be welcome. An old schoolhouse serves as the community center, where a chalkboard lists residents' birthdays every month. The Lighthouse Marine Park sits not too far from a 1,000-slip marina. The Wackie Walkers meet up at the park every Tuesday and Thursday. They're an opinionated group that reflects the population here: a mix of retirees, nature lovers, hippies who left the mainland and Canadians. Rocks crunch underfoot as they stroll through the park toward the marina. It's not uncommon to see a pod of orcas swimming by or an eagle soaring overhead. The Wackie Walkers of Point Roberts, Washington, say the strict border checkpoint is the biggest change since 9/11. The Wackie Walkers point to the tightened border as the most obvious way their lives were affected by 9/11. It's like the airport security most people experience, but on steroids. Some residents go into Canada three or four times a day: for shopping, for running errands, for meeting friends. "If you make many trips in a day, they get suspicious," Kandace Harper says. Residents carry lists of the fruits and vegetables allowed back in the States. It changes monthly. The enforcers rummage through grocery bags and confiscate things like lettuce when it's on the banned list. Says Barbara Bradstock, "It just makes your day unpleasant if you get a guard with a chip on his shoulder." But it comes with the territory. "It's a rustic, peaceful quiet way to live," she says. "Here, you feel safe. I'm not worried about a terrorist blowing up Point Roberts." I've heard some residents moved here after 9/11 for just that -- the security and isolation the Point provides. I ask the walkers if this is really true. Up steps Elizabeth Lantz. She and her husband were at Los Angeles International Airport on September 11, 2001, preparing to fly home to Hawaii. Then, all flights were halted. The nation was under attack. The couple hopped in a car and drove for two weeks, "until we weren't scared any more." "I was crying the whole time," she says. They contemplated life: How would they reach loved ones if they continued to live in Hawaii and more attacks occurred? By 2004, they moved to Point Roberts. "The border is a hassle, but I don't have any issues with it," she says. "It's really safe here. I never take the keys out of my car." 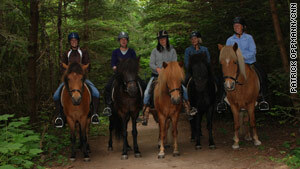 "The Desperate Horsewives" of Point Roberts say 9/11 has touched everyone in different ways. Down a dirt path a bit later, amid towering red cedars that provide the aura of a Harry Potter forest, I meet five women trotting on Icelandic horses. They call themselves "The Desperate Horsewives." Stephanie Dobb, a Point resident, peers down from her horse and recounts her humiliating post-9/11 story. She'd gone to the doctor's office in Bellingham on the mainland, more than an hour away but the closest place for residents to get good medical care. She had a nuclear medicine scan and got a note from the doctor to show customs officers upon her return home. But before she could do that, she set off radiation sensors at the checkpoint. Armed guards rushed to her vehicle. The border shut for an hour. She was grilled. "It was almost like they treated me as a training exercise," she says. As the Desperate Horsewives gallop off, I think about this odd symbiotic relationship between residents and the border enforcers. The stringent new measures ensure this enclave will always remain quaint, secure and the best hidden-gem in America. Yet it comes with a cost, something quintessentially un-American: a restriction on freedoms and an abundance of government intrusion. I learn the harsher realities of what it means to live in post-9/11 America from my olive-skinned taxi driver -- who only shared his first name, Sonny -- en route to the Seattle airport. He came to the U.S. from India seven years ago for love -- of his wife and a better future. After terror mastermind Osama bin Laden was killed in May, he says he heard a Pakastani man living near Microsoft's headquarters found a note on his car: "We don't want you here." He's not sure if it's true, but he can relate. Sometimes drunken people get in his taxi and speak their minds: "Go back to India! Why are you taking all our jobs at Microsoft?" "I tell them: Look, I have nothing to do with Microsoft. I'm just driving you to your next spot." "I take it all in stride," says Sonny, who worked at the U.S. Consulate in Mumbai on 9/11. "You can do anything here. You just have to put your mind to it." My next destination is Monticello, Iowa, a town of 3,656 sandwiched between cornfields 1,000 miles from ground zero. Monticello carries the name of the famous Virginia home of Thomas Jefferson, America's third president. But not the pronunciation: Here it's Mon-ti-sello. The town has received a steel beam from the ground zero rubble. The Port Authority is distributing 1,300 beams to towns and cities, in all 50 states and six other countries, for public memorials so the attacks will never be forgotten. On my way to Monticello, I take a slight detour along Interstate 80, America's "Main Street" that stretches 3,000 miles from New York to San Francisco. The Iowa 80 truck stop is a nirvana of Americana, where you can buy chrome, catch a movie or visit the dentist. Situated along the superhighway, in the town of Walcott, sits a nirvana of Americana : the "Iowa 80: World's Largest Truckstop." It's said truckers see America through a different prism: their movie-screen-sized windshields. I want to know, what do they see 10 years after the terrorist attacks? 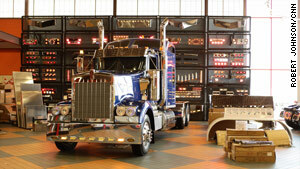 An 18-wheeler named "America the Beautiful" welcomes truckers to the stop. On its side is a landscape painting featuring famous sites along I-80. You can buy big rig lights and fenders here, get your teeth fixed at the dentist and catch a movie at the truck stop theater. I find Richard Plascencia, 41, of Garrison, Iowa, standing amid the aisles of chrome in the Super Truck Showroom. "I didn't see a plane hit," he says. "All I saw was the smoke." Plascencia breaks down in tears as he recalls that day. He got stuck in traffic on a bridge outside New York City and watched the attacks unfold from his windshield, saw the towers fall. "Ever since then, I haven't been back." A week after the attacks, he was trucking across the New Jersey Turnpike when a bomb threat was called in. Traffic stopped dead for hours. He took out a Sharpie and wrote his name all over his body. If he was blown to smithereens, Richard wanted to be identified. He sobs more, pulls out the dog tags around his neck. "I had these made after that," he says. The tags identify him by name and religion (Catholic). "Terrorism to me up to that day was a movie plot -- something Hollywood manufactured," he says. "You knew it existed somewhere on the other side of the world, but it didn't affect you. "I honestly think 9/11 was America's wake-up call. We were too confident back then. We'd become a society of slackers." He's driven more than a million miles over the last 10 years, hauling everything from dog food to tractor parts. He sticks mostly to the Midwest, to be close to home. He has two young children now, and focuses on them. "As far as that tragedy, if anything good came out of it, it's the way I live my life today. "Those that got killed that day, even though I don't know their names, I'll always remember them. I don't think they lost their lives in vain. It affected each and every one of us as Americans." He takes me out to see his truck: a humble red-and-white Freightliner. He'll go back to New York one day. It's just too emotional right now. Before we part, he asks why I feel compelled to tell this story. "The 10-year anniversary is coming up," I say. He stops in his tracks. "Damn," he says, "it's been 10 years?" This beam from the towers will stand upright with a metal flag attached to it as a memorial in Monticello, Iowa. I head back into the showroom, where I find Paul Adams, a 67-year-old Air Force veteran from Little River, South Carolina. His primary job these days is moving families from place to place. His main client: the nation's soldiers and Marines. Every time he leaves one of their homes he offers a salute: "A veteran to a soldier, for everything you're doing for me, thank you." He speaks in a voice as smooth as Morgan Freeman's. The biggest impact for truckers is at the gas pump: Gas cost $1.53 a gallon on 9/11. They also face extra security checks everywhere they go now. "If I had to take off every piece of furniture, I wouldn't mind. Whatever it takes to make this country safe." On a recent trip to Washington state, he says, a motorcade escorted a truck that barreled by him. The rig carried a beam from the towers. "I stopped and saluted. That's how it affected me," he says. "That's one of the most amazing things I've ever seen." I tell him I'm on my way to Monticello, to see the town's tower beam. He's headed to Fort Bragg, North Carolina, to help another military family move. Monticello might seem an odd spot to build a 9/11 memorial. No one from the town of 3,796 died in the attacks. But scratch below the surface, and you find the people here are representative of the nation. Residents fear more terror attacks. Many are wary of Muslims. They don't like traveling on planes because of the hassle. Some ditched air travel altogether: "If I can't get there by driving, there's no reason to visit." On 9/11, Monticello gas stations overflowed with panicked people. When a "foreign-looking" man was spotted snapping photos outside the elementary school, police arrived in less than three minutes. Now, business has slowed at the gas stations. Far fewer people fly the American flag from their cars and trucks than in those days after the attacks. Yet don't mistake this as a community unchanged by 9/11. It's simply a sign of how life moves on. The police station sits at the edge of town, around the corner from Darrell's: A Family Tradition, a diner that's fed residents and passersby since 1947. 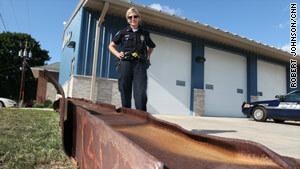 The 21-foot, 1,400-pound steel beam from the towers rests outside the police building and across from the fire department. It's rusted, twisted, almost haunting. Touch it and you feel a part of sacred ground. Knock on it and a chilling sound shoots out and into your soul. Words are thrown around like 'hero.' But at the end of the day, he was just my brother. And that's what I miss the most. I miss my brother. "When it first rolled in, it made the hair stand up on my arms," says police Sgt. Dawn Graver. Police Chief Britt Smith and other town officials felt the memorial would be a great way to remember those killed, especially the 343 firefighters, 37 Port Authority officers and 23 New York police officers. "The fight was brought to us that day, and we felt it was something we needed to memorialize," the police chief says. "It was an honor for us to bring a piece of that history to the Midwest where we were kind of distanced from the event itself. "When you actually see it up close and how twisted and mangled this piece of metal is," he says, "everybody kind of takes a moment and reflects on it and what it means to our history. You're reflecting on what it means to our country." This September 11, the beam will stand upright, a steel flag attached to the top, a testament of pride, of hope, of never forgetting. It will sit in a footprint shaped in the form of the Pentagon, surrounded by Pennsylvania bricks. Middletown, New Jersey, is a sprawling township of 66,522 and sits along Sandy Hook Bay and Raritan Bay, across from New York City. It's a mix of suburban strip malls and quaint Northeastern homes tucked along winding streets and beneath shade trees. Residents range from Wall Street analysts to blue-collar guys, from teachers to long-time fishermen. Famous residents include Jon Bon Jovi and Max Weinberg, the drummer from Bruce Springsteen's E Street Band. It also carries the distinction of being one of the hardest hit towns on 9/11: 37 of its residents were killed that day. Today, a fog casts an eerie pall over the town's train station, the departure point for many of those who never returned on that clear, sunny morning. A short walk from the train station is an archway greeting visitors: "Middletown World Trade Center Gardens." A pathway leads through a grove of trees. Thirty-seven giant stones honor the fallen, each with an inscription. Michael Egan: The bridge between the land of the living and the land of the dead is love. Felicia Hamilton: She was a woman with a gentle soul, her heart was opened to those she loved. Rosanne P. Lang: We celebrate your laughter, your love, your life -- until we meet again. Jim Halloran keeps a box filled with newspaper clippings honoring his brother, fire Lt. Vincent "Vinny" Halloran. Across town, Jim Halloran stands at his kitchen table and opens a box marked "Vinny 9/11." Halloran has never walked through the town memorial. He felt isolated in his grief. While Middletown honored its 37, he mourned privately for his brother, New York Fire Lt. Vincent "Vinny" Halloran. Jim Halloran holds up his cell phone and presses play on a YouTube video. The screen shows a New York firefighter standing over a manhole. "That's my brother," he says. "That's Vinny." The camera pans up just in time to catch American Airlines Flight 11 flying into the North Tower. It's the only known video of the first plane at impact. A camera crew had been following another firefighter that morning for a documentary. They just happened to be rolling when the plane hit, catching Vinny Halloran at work. He rushed to the World Trade Center, where he led five firefighters up 30 flights into the fiery unknown. After the other tower collapsed, they rushed back down, helping as many people as they could. Vinny's five colleagues made it out alive. At 10:28 a.m., he was still inside. That's when the North Tower crumbled. "I have to believe that whatever happened was quick and painless, and that he didn't suffer. Maybe I just couldn't imagine it any other way." He tries to avoid watching the news as September 11 approaches. If the video of his brother catches him off guard, it can send him back. "I try not to think of that as his final image," he says. "I try to think about all the fun and good times we had together, whether growing up or as young adults with our kids. Those are the types of things I like: his smile, his laughter, the way he made everybody feel." The street outside Ladder Co. 8 is now named: "Lieutenant Vincent G. Halloran Street." Vinny didn't know his wife was pregnant when he died. His only daughter was born eight months after the attacks. His five sons have now grown into young men and teenagers. "As the years go by, everyone focuses on 9/11 and his role in that. He saved a lot of people. We know that," Halloran says. "Words are thrown around like 'hero.' But at the end of the day, he was just my brother. And that's what I miss the most. I miss my brother." He cried nearly every day for two years. He eventually reached the point: "My brother doesn't want me to be sad all the time." Helping channel his grief was youth soccer. The terror attacks were so inexplicable, so horrible, so terrifying: "We couldn't understand it as adults, so how could kids understand it. You wondered: Where is our world going? What's the future hold for our children?" A father of three sons, Halloran began coaching and now heads The Middletown Soccer Club. The innocence of the kids running around on the fields -- knowing something major had happened but not knowing its significance -- brought temporary relief. Scoring goals replaced crying tears. For an hour and a half at a time, he found peace. "You start saying, 'If we can bring some normalcy back into their lives, then maybe that starts to build the normalcy back in our lives.' And I think that's what happened with me." His team this year is a group of 8-year-olds. For the first time, all his players were born after 9/11. The season kicks off September 11. There will be a moment of silence before the whistle blows. Halloran will think of his brother and all that was lost that day. "A lot of people say, 'I can't believe 10 years has gone by so fast.' But it feels like a hundred years ago since I saw my brother. It feels like a lifetime ago." He will huddle his players. Winning or losing won't be his focus. "Do something nice for somebody else today," he'll tell the team. And that's his message for everyone this anniversary. "Let's make a positive out of it." That's what they've done in Point Roberts: made peace with the border hassle that protects the nation. In Monticello: turned a tragic reminder into a point of reflection. And across America: moved forward without forgetting. -- CNN's Robert Johnson and Patrick Oppmann contributed to this report.